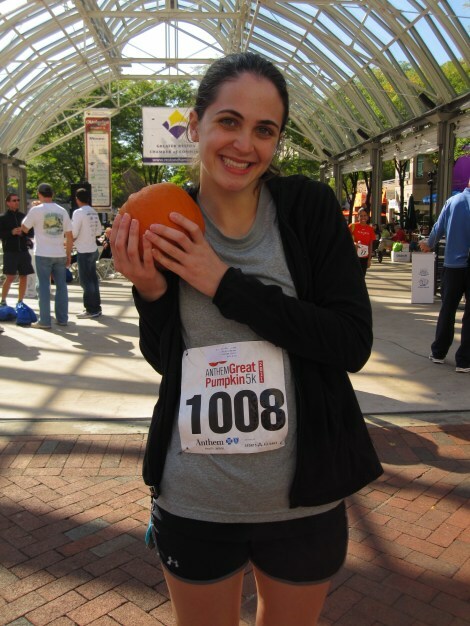 Last week I did the first edition of "Blogger Interview" with Ali from Ali Runs. Today I am happy to bring you the second edition of Blogger Interview. This time it is with Casey from This Girl Can Run. She lives in Virginia and I really enjoy reading her posts. 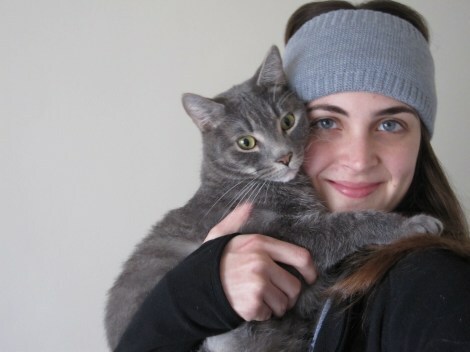 It doesn't hurt that she has two adorable cats, one who sort of looks like one of our cats, Teagan! I hope you enjoy this interview with Casey! I started running during the spring of this year - the same time as Jamie as a matter of fact! I started because my co-workers had signed up for a 10K and I was fiercely determined to run the whole distance without walking. I had been really active up until the start of college...and then I wasn't so great about going to the gym. I wanted to give myself some real goals besides doing an elliptical for 30 minutes three times a week. My shoes! As long as I have a pair of running shoes, I don't need anything else. I am grateful every day to be healthy enough to run and to be able to afford some new running goodies every now and then. 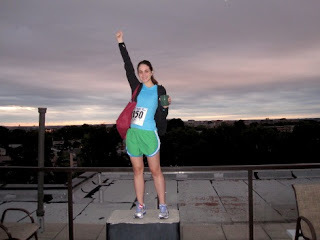 The first race I ever ran, which was the Zooma Annapolis 10K. I felt so many emotions that day. The course was beautiful - it went through downtown historic Annapolis - and all of the runners had so much support and love for each other. I couldn't believe how everyone cheered for each other and offered encouragement. I had assumed that people ran to win races or because they had some sort of crazy personality complex, but after running that race, I realized that people run for so much more. 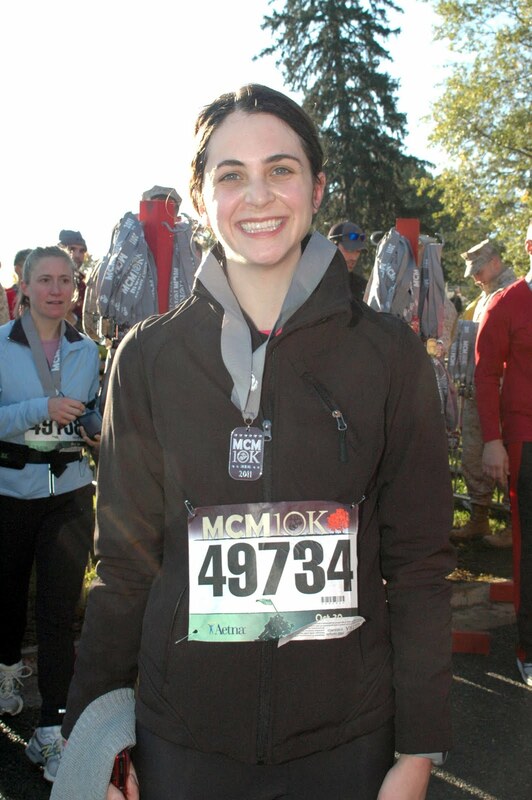 Because of that race, I always cheer on other runners and make noise, even if I'm the only one doing it. That 10K was the first time I had ever made a fitness goal for myself. I never realized how motivated I am by goals! It's important to have goals in your life, even if they are small, just to show yourself you are capable of accomplishment. Plus, exercise goals can sometimes be much easier than making goals in other areas of our lives! I think in the future I might start with the intention to have fun and not worry about pace and time. Races are expensive though. Maybe I need to start doing some simple local races for fun? I have been trying to come up with an effective strategy for this! I like to bring a couple dates (the fruit, not boys, lol) with me in my gym bag so I can snack on them right when I'm finished. They tide me over until I can get home - I workout in the evenings - and make myself some dinner. I don't mind if I'm out of energy later since it gets me ready to sleep. On the weekends, when I work out in the morning, after I finish, I typically have a glass of almond milk with some protein powder mixed in. Then I eat a bagel with peanut butter and greek yogurt with granola. I also snack on raisins or dried cranberries until lunch. I always makes sure to eat an early lunch too. That usually is a salad or some veggies. I would say I haven't perfected my refueling strategy, but it's a start. I hate cheesecake! I don't even like eating at Cheescake Factory just because of the name. I know they have a ton of other food, but I can't stand it. Make sure you check out Casey's blog for more running fun and other cute cat photos! Want to be a part of the "Blogger Interview" series? Send me an email at fromcouchtoironwoman@gmail.com and we can get the ball rolling! We all sort of started really running around the same time. I started during summer break of this year. I just made a RAW Pumpkin Pie Cheesecake yesterday, and was able to try it tonight after it set overnight in the freezer. OOOhhhhhh YUM!! It's made with all nutritious ingredients!! My meat eater hubby tried it and declared it was really good! Maybe it's the kind of 'cheesecake' that Casey would like. Awesome interview Jamie....good to get to know you Casey! I have family in Sterling and Alexandria, VA, and Lynchburg, VA. If you are in those areas, maybe you've run in a race with some of my family! !